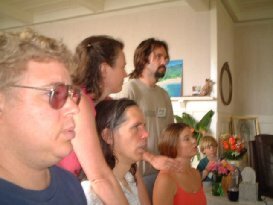 Heart of Healing workshops began in 2001 in New York as a synthesis of Naka Ima workshops (which later spawned Heart of Now) which focuses on freeing both inner and outer consciousness and communication, together with a comprehensive approach to understanding and supporting self-healing of the physical and energetic body. Extensive work with breath and emotions, emphasizing acceptance, awareness, identification and sharing, as well as work in small focused teams allows participants to make great strides in the course of an intensive weekend workshop. Group sizes are small and a high ratio of assistants to first time students ensures a depth of experience that reaches the core of who we are and how we are being. Assistants often choose to participate many times at a support level in the basic workshop both to help others receive the gifts they so appreciate, and to further their own skill sets.